Accurate data control is a requirement in most industries. Recording data at each stage of the manufacturing process ensures a traceable product and allows for an assurance of quality on every item. But when multiple layers of data are required, recording this as part of an efficient production process can be challenging. Supervisory control and data acquisition (SCADA) is a control system of software and hardware components that helps manufacturers to efficiently process data and communicate system issues that ultimately mitigate downtime. SCADA solutions are used across many industries, and Dundee based SP Technology has designed a solution for the pharmaceutical industry using a Beckhoff XTS system – the largest of its kind in the UK. The challenge faced by the customer was to accurately label medical inhalers (the likes used to ease asthma attacks) and to monitor data from every device. This required reading and recording the 2D printed product barcode during loading and matching this with the 2D barcodes on the labels, ensuring batch traceability on every device. With over 90 devices processed per minute, the customer required a system that could reliably monitor and record this data, while not inhibiting production output. The solution was to design a bespoke system. This was developed using a Beckhoff XTS system, controlled by their Twin CAT 3 software. At over 14 metres long, this is the largest system of its kind in the UK, utilising three large XTS Systems (eXtended Transport System). The design involved passing the devices through a series of cells using mechanical, servo, labelling and vision equipment technologies. This system consisted of three cells: the first applying a cap label, the second a body label, and the third cell applying a bung label. The machine loaded eight devices at a time from a stack of trays inputted by an operator. Each XTS mover holds up to three devices, that once loaded, travel to the first labeller. If the label is presented skewed a servo device re-orientates the label, then sends the centre position of the label to the XTS mover to be recorded. Each cell had three separate labellers that apply a label to each of the devices held on the XTS mover, this allows for label bypasses should a reel need to be replaced keeping the machine running during changeovers, with no downtime and maximum output efficiency. Once the label is applied, the XTS mover then progresses each device to a station that rotates around the devices to ensure a full wraparound of the label. Once complete, all devices are checked by a Cognex vision system to ensure the label has been applied correctly. The devices are then picked from Cell 1 and transferred to Cell 2 to have the body label applied in a similar manner that includes information relating to the batch such as the batch number, expiry date and manufacture date. The devices are inspected for label position via a Cognex camera and are then transferred 12 at a time from Cell 2 to Cell 3. Cell 3 applies the bung label to the bottom of the device, in a similar process to Cell 1. Once the devices have passed through all three cells, they are checked before being presented to an ABB robot. The ABB robot rejects any that are not up to a stringent quality assessment. Devices that do pass the inspection processes are placed into individual pucks on an output conveyor and transferred to a pick and place unit that re-populates the empty trays from the start of the process. Every operation at each cell of the process is recorded. A “pass” or “fail” result is attributed to every device as it travels through the machine that allows the devices to be tracked. When the devices are either rejected by the robot, or placed onto the output conveyor, all of the data corresponding to each operation performed throughout the machine is recorded and appended into a .csv file, available to the operator once the batch has been completed. The information supplied to the operator includes all of the devices that have passed through the system in the current batch. This includes a history on which devices have passed or failed any points in the process, allowing the operator to investigate what areas are potential hotspots for failure that might indicate a faulty station. We developed this automated solution using the Beckhoff XTS system. The system’s exacting requirements compensated for inaccuracies in the labels supplied on reels and enabled us to position the XTS movers to within +/- 0.1mm accuracy that allowed the reel to be move should it begin to drift. Using a combination of Cognex Vision Systems, we were able to pass the measured label positions obtained from the Vision Systems into the XTS system, ensuring accuracy on every label. As there was no guarantee of the label position radially (theta axis), we also developed a servo orientation label placement head to detect and correct the theta position. This enables us to identify additional offsets, and using the Beckhoff Control system, and orientate or wipe the label into place. The Cognex Vision System also allows the operators to connect remotely to each vision system. The operator can then record any failures and make any necessary adjustments to the equipment that may be required. The success of this project is the result of the collaborative approach of SP Technology and Beckhoff Systems. 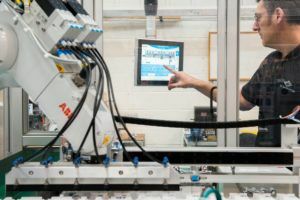 By fully understanding the challenges faced by the client, a bespoke solution was developed using up-to-date technologies to capture data and whilst ensuring maximum production efficiency.